"Food supplement" redirects here. For food additions that alter the flavor, color or longevity of food, see Food additive. The U.S. Institute of Medicine sets Tolerable upper intake levels (ULs) for some of the vitamins. This does not prevent dietary supplement companies from selling products with content per serving higher than the ULs. For example, the UL for vitamin D is 100 µg (4,000 IU), but products are available without prescription at 10,000 IU. As of 2010,[update] annual sales of sport nutrition products in the United States was over US$2.7 billion according to a publication by Consumer Reports. 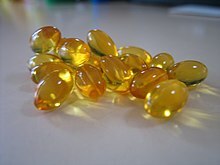 ^ "Cod liver oil". Encyclopædia Britannica, Inc. 2018. Retrieved 18 February 2018. ^ "Dietary Supplements: Background Information". Office of Dietary Supplements, US National Institutes of Health. 24 June 2011. Retrieved 2 February 2018. ^ a b "Food Supplements". European Food Safety Authority, European Commission. 2009. ^ a b Brodwin, Erin (8 November 2017). "The $37 billion supplement industry is barely regulated — and it's allowing dangerous products to slip through the cracks". Business Insider Inc. Retrieved 31 January 2018. ^ a b "Dietary Supplement Label Database". Office of Dietary Supplements, US National Institutes of Health. 2017. ^ Park, Madison. "Half of Americans use supplements". CNN. Retrieved 3 October 2013. ^ a b "FAQs on Dietary Supplements". Office of Dietary Supplements, US National Institutes of Health. ^ a b "Structure/Function Claims". Office of Dietary Supplement Programs, Center for Food Safety and Applied Nutrition, U.S. Food and Drug Administration. 14 December 2017. ^ Dietary Supplement Labels: Key Elements Office of Inspector General, Depart of Health and Human Services (2003). ^ Guidance for Industry: Frequently Asked Questions About Medical Foods; Second Edition U.S. Food and Drug Administration (May 2016). ^ Drouin G, Godin JR, Pagé B (2011). "The genetics of vitamin C loss in vertebrates". Curr. Genomics. 12 (5): 371–378. doi:10.2174/138920211796429736. PMC 3145266. PMID 22294879. ^ EFSA Journal 2010; 8(5):1609 EFSA Panel on Dietetic Products, Nutrition and Allergies (NDA). ^ Qualified Health Claims: Letters of Enforcement Discretion U.S. Food and Drug Administration. ^ Selenium and a Reduced Risk of Site-specific Cancers, FDA-2008-Q-0323 U.S. Food and Drug Administration. ^ Liao CD, Tsauo JY, Wu YT, Cheng CP, Chen HC, Huang YC, Chen HC, Liou TH (2017). "Effects of protein supplementation combined with resistance exercise on body composition and physical function in older adults: a systematic review and meta-analysis". Am. J. Clin. Nutr. 106 (4): 1078–1091. doi:10.3945/ajcn.116.143594. PMID 28814401. ^ a b Colonetti T, Grande AJ, Milton K, Foster C, Alexandre MC, Uggioni ML, Rosa MI (2017). "Effects of whey protein supplement in the elderly submitted to resistance training: systematic review and meta-analysis" (PDF). Int J Food Sci Nutr. 68 (3): 257–264. doi:10.1080/09637486.2016.1232702. PMID 27653283. ^ a b Nutrition for Athletes, International Olympic Committee Nutrition Working Group of the Medical and Scientific Commission of the International Olympic Committee, Revised and Updated in June 2016. ^ Stonehouse W, Wycherley T, Luscombe-Marsh N, Taylor P, Brinkworth G, Riley M (2016). "Dairy Intake Enhances Body Weight and Composition Changes during Energy Restriction in 18-50-Year-Old Adults-A Meta-Analysis of Randomized Controlled Trials". Nutrients. 8 (7): 394. doi:10.3390/nu8070394. PMC 4963870. PMID 27376321. ^ Naclerio F, Larumbe-Zabala E (2016). "Effects of Whey Protein Alone or as Part of a Multi-ingredient Formulation on Strength, Fat-Free Mass, or Lean Body Mass in Resistance-Trained Individuals: A Meta-analysis" (PDF). Sports Med. 46 (1): 125–137. doi:10.1007/s40279-015-0403-y. PMID 26403469. ^ Miller PE, Alexander DD, Perez V (2014). "Effects of whey protein and resistance exercise on body composition: a meta-analysis of randomized controlled trials". J Am Coll Nutr. 33 (2): 163–175. doi:10.1080/07315724.2013.875365. PMID 24724774. ^ a b Bilsborough, Shane; Neil Mann (2006). "A Review of Issues of Dietary Protein Intake in Humans". International Journal of Sport Nutrition and Exercise Metabolism. 16 (2): 129–152. doi:10.1123/ijsnem.16.2.129. ^ Tarnopolsky MA, Atkinson SA, MacDougall JD, Chesley A, Phillips S, Schwarcz HP (1992). "Evaluation of protein requirements for trained strength athletes". Journal of Applied Physiology. 73 (5): 1986–1995. doi:10.1152/jappl.1992.73.5.1986. PMID 1474076. ^ Lemon, PW (1995). "Do athletes need more dietary protein and amino acids?". Int J Sport Nutr. 5 Suppl: S39–561. doi:10.1123/ijsn.5.s1.s39. PMID 7550257. ^ a b c Morton RW, Murphy KT, McKellar SR, Schoenfeld BJ, Henselmans M, Helms E, Aragon AA, Devries MC, Banfield L, Krieger JW, Phillips SM (2017). "A systematic review, meta-analysis and meta-regression of the effect of protein supplementation on resistance training-induced gains in muscle mass and strength in healthy adults". Br J Sports Med. 52 (6): bjsports–2017–097608. doi:10.1136/bjsports-2017-097608. PMC 5867436. PMID 28698222. ^ Cermak NM, Res PT, de Groot LC, Saris WH, van Loon LJ (2012). "Protein supplementation augments the adaptive response of skeletal muscle to resistance-type exercise training: a meta-analysis". Am. J. Clin. Nutr. 96 (6): 1454–1464. doi:10.3945/ajcn.112.037556. PMID 23134885. ^ Finger D, Goltz FR, Umpierre D, Meyer E, Rosa LH, Schneider CD (2015). "Effects of protein supplementation in older adults undergoing resistance training: a systematic review and meta-analysis". Sports Med. 45 (2): 245–255. doi:10.1007/s40279-014-0269-4. PMID 25355074. ^ "Regulatory Issues: Meal Replacements – Convenience or Compromise?". Food Processing. ^ Medical Foods Guidance Documents & Regulatory Information U.S. Food and Drug Administration. ^ Charles EJ, Johnston LE, Herbert MA, Mehaffey JH, Yount KW, Likosky DS, Theurer PF, Fonner CE, Rich JB, Speir AM, Ailawadi G, Prager RL, Kron IL (2017). "Impact of Medicaid Expansion on Cardiac Surgery Volume and Outcomes". Ann. Thorac. Surg. 104 (4): 1251–1258. doi:10.1016/j.athoracsur.2017.03.079. PMC 5610068. PMID 28552372. ^ Komar B, Schwingshackl L, Hoffmann G (2015). "Effects of leucine-rich protein supplements on anthropometric parameter and muscle strength in the elderly: a systematic review and meta-analysis". J Nutr Health Aging. 19 (4): 437–446. doi:10.1007/s12603-014-0559-4. PMID 25809808. ^ Dong JY, Qin LQ, Zhang Z, Zhao Y, Wang J, Arigoni F, Zhang W (2011). "Effect of oral L-arginine supplementation on blood pressure: a meta-analysis of randomized, double-blind, placebo-controlled trials". Am. Heart J. 162 (6): 959–965. doi:10.1016/j.ahj.2011.09.012. PMID 22137067. ^ "the definition of amino acid". Dictionary.com. Retrieved 2017-02-22. ^ Cruz-Jentoft AJ (May 2017). "Beta-hydroxy-beta-methyl butyrate (HMB): From experimental data to clinical evidence in sarcopenia". Current Protein & Peptide Science. 18 (7): 668–672. doi:10.2174/1389203718666170529105026. PMID 28554316. HMB is widely used as an ergogenic supplement by young athletes. ^ a b c Navarro, V; Khan, I; Björnsson, E; Seeff, L. B; Serrano, J; Hoofnagle, J. H (2016). "Liver Injury from Herbal and Dietary Supplements". Hepatology. 65 (1): 363–373. doi:10.1002/hep.28813. PMC 5502701. PMID 27677775. ^ McGinn, Dave (7 November 2010). "Are protein shakes the weight-loss magic bullet?". Globe and Mail. Retrieved 1 December 2010. ^ a b c "Omega−3 Fatty Acids and Health: Fact Sheet for Health Professionals". US National Institutes of Health, Office of Dietary Supplements. 2 November 2016. Retrieved 5 April 2017. ^ "Overview on Dietary Reference Values for the EU population as derived by the EFSA Panel on Dietetic Products, Nutrition and Allergies" (PDF). 2017. Archived (PDF) from the original on August 28, 2017. ^ Rizos, EC; Elisaf, MS (June 2017). "Does Supplementation with Omega-3 PUFAs Add to the Prevention of Cardiovascular Disease?". Current Cardiology Reports. 19 (6): 47. doi:10.1007/s11886-017-0856-8. PMID 28432658. ^ Grey, Andrew; Bolland, Mark (March 2014). "Clinical Trial Evidence and Use of Fish Oil Supplements". JAMA Internal Medicine. 174 (3): 460–462. doi:10.1001/jamainternmed.2013.12765. PMID 24352849. ^ "Botanicals". European Food Safety Authority. 2018. Retrieved 1 February 2018. ^ a b c Prince, Jennifer (13 September 2017). "U.S. Herbal Supplement Sales Up 7.7% in 2016". Nutritional Outlook. Retrieved 1 February 2018. ^ "Natural and Non-prescription Health Products". Government of Canada. 2018. Retrieved 1 February 2018. ^ Barrett, Stephen (23 November 2013). "The herbal minefield". Quackwatch. Retrieved 1 February 2018. ^ a b c Zhang, J; Wider, B; Shang, H; Li, X; Ernst, E (2012). "Quality of herbal medicines: Challenges and solutions". Complementary Therapies in Medicine. 20 (1–2): 100–106. doi:10.1016/j.ctim.2011.09.004. PMID 22305255. ^ a b Coghlan, M. L.; Haile, J; Houston, J; Murray, D. C.; White, N. E.; Moolhuijzen, P; Bellgard, M. I.; Bunce, M (2012). "Deep Sequencing of Plant and Animal DNA Contained within Traditional Chinese Medicines Reveals Legality Issues and Health Safety Concerns". PLoS Genetics. 8 (4): e1002657. doi:10.1371/journal.pgen.1002657. PMC 3325194. PMID 22511890. ^ "Quality of Natural Health Products Guide". Government of Canada. 1 May 2015. Retrieved 1 February 2018. ^ Becker, Mark (8 March 2016). "Dietary Supplements in Europe Poised for Profound Growth". Natural Products Insider. Retrieved 1 February 2018. ^ Thursby E, Juge N (2017). "Introduction to the human gut microbiota". Biochem. J. 474 (11): 1823–1836. doi:10.1042/BCJ20160510. PMC 5433529. PMID 28512250. ^ a b "Probiotic Health Claims". Food Safety Authority of Ireland. 5 May 2017. Retrieved 4 February 2018. ^ Rijkers GT, de Vos WM, Brummer RJ, Morelli L, Corthier G, Marteau P (2011). "Health benefits and health claims of probiotics: Bridging science and marketing". British Journal of Nutrition. 106 (9): 1291–1296. doi:10.1017/S000711451100287X. PMID 21861940. ^ a b Slashinski MJ, McCurdy SA, Achenbaum LS, Whitney SN, McGuire AL (2012). ""Snake-oil," "quack medicine," and "industrially cultured organisms:" biovalue and the commercialization of human microbiome research". BMC Medical Ethics. 13: 28. doi:10.1186/1472-6939-13-28. PMC 3512494. PMID 23110633. ^ a b Crane, Michael (14 October 2015). "Crackdown on Probiotic Health Claims Costs Billions for EU Yogurt Industry". Nutritional Outlook. Retrieved 1 February 2018. ^ Grebow, Jennifer (1 November 2016). "Probiotic Supplements Will Be the #1 Fastest-Growing Supplement in North America through 2021, Says Euromonitor at SupplySide West". Nutritional Outlook. Retrieved 4 February 2018. ^ a b "Dannon Agrees to Drop Exaggerated Health Claims for Activia Yogurt and DanActive Dairy Drink FTC Charges that Evidence Supporting Benefits of Probiotics Falls Short". Federal Trade Commission, US Government. 15 December 2010. Retrieved 9 May 2017. ^ Doron S, Snydman DR (2015). "Risk and safety of probiotics". Clin Infect Dis (Review). 60 Suppl 2: S129–S134. doi:10.1093/cid/civ085. PMC 4490230. PMID 25922398. ^ Durchschein F, Petritsch W, Hammer HF (2016). "Diet therapy for inflammatory bowel diseases: The established and the new". World J Gastroenterol (Review). 22 (7): 2179–2194. doi:10.3748/wjg.v22.i7.2179. PMC 4734995. PMID 26900283. ^ "Supplement Industry Contributes $122 Billion To U.S. Economy". Nutraceuticals World. 10 June 2016. Retrieved 1 February 2018. ^ "Report Forecasts Supplement Market to Reach $278 Billion by 2024". Nutraceuticals World. 1 July 2016. Retrieved 1 February 2018. ^ a b c d Office, U. S. Government Accountability (18 March 2013). "Dietary Supplements: FDA May Have Opportunities to Expand Its Use of Reported Health Problems to Oversee Products" (GAO-13–244). Government Accountability Office, US Government. Retrieved 2 February 2018. ^ a b Harmon, Katherine (28 May 2010). "Herbal Supplement Sellers Dispense Dangerous Advice, False Claims". Scientific American. Retrieved 2 February 2018. ^ McGinn, Dave (26 March 2017). "Are protein shakes the weight-loss magic bullet?". The Globe and Mail (Toronto). Retrieved 2 February 2018. ^ Griffith-Greene, Megan (November 13, 2015). "Marketplace: Some protein powders fail fitness test". CBC News. Retrieved December 11, 2015. ^ "Supplements: Company statements". CBC News. November 13, 2015. Retrieved December 11, 2015. ^ Newmaster, Steven G; Grguric, Meghan; Shanmughanandhan, Dhivya; Ramalingam, Sathishkumar; Ragupathy, Subramanyam (2013). "DNA barcoding detects contamination and substitution in North American herbal products". BMC Medicine. 11: 222. doi:10.1186/1741-7015-11-222. PMC 3851815. PMID 24120035. ^ O'Connor, Anahad (3 February 2015). "New York Attorney General Targets Supplements at Major Retailers". The New York Times. Retrieved 1 February 2018. ^ a b Susan Scutti (12 October 2018). "Nearly 800 dietary supplements contained unapproved drug ingredients". CNN. Retrieved 15 October 2018. ^ "Food supplements". European Commission. 2019. Retrieved 31 January 2019. ^ "Dietary Supplements". US Food and Drug Administration. 12 December 2017. Retrieved 31 January 2019. ^ "Dietary Supplement Labeling Guide: Chapter I. General Dietary Supplement Labeling". US Food and Drug Administration. 21 March 2018. Retrieved 31 January 2019. ^ "FDA Warning Letters, 2018". US Food and Drug Administration. 29 January 2019. Retrieved 31 January 2019. ^ Steven E. Porter (20 June 2016). "Warning letter: Vitalife Inc". Inspections, Compliance, Enforcement, and Criminal Investigations, US Food and Drug Administration. Retrieved 31 January 2019. ^ a b Ronald M. Pace (18 December 2017). "Warning letter: Maine Natural Health, Inc". Inspections, Compliance, Enforcement, and Criminal Investigations, US Food and Drug Administration. Retrieved 3 February 2018. ^ Miriam R. Burbach (31 August 2018). "Warning letter: Independent Nutrition Inc". Inspections, Compliance, Enforcement, and Criminal Investigations, US Food and Drug Administration. Retrieved 31 January 2019. ^ "Dietary supplement concerns? Tell the FTC and FDA". Federal Trade Commission, US Government. 25 July 2017. Retrieved 2 February 2018. ^ "Three Dietary Supplement Marketers Settle FTC, Maine AG Charges". Federal Trade Commission, US Government. 23 August 2017. Retrieved 2 February 2018. ^ "New Dietary Ingredients in Dietary Supplements - Background for Industry". US Food and Drug Administration. August 2016. Retrieved 2 February 2018. ^ Bersani, F. S; Coviello, M; Imperatori, C; Francesconi, M; Hough, C. M; Valeriani, G; De Stefano, G; Bolzan Mariotti Posocco, F; Santacroce, R; Minichino, A; Corazza, O (2015). "Adverse Psychiatric Effects Associated with Herbal Weight-Loss Products". BioMed Research International. 2015: 1–10. doi:10.1155/2015/120679. PMC 4589574. PMID 26457296. ^ Lichtenstein, Alice H.; Russell, Robert M. (2005). "Essential Nutrients: Food or Supplements?". JAMA. 294 (3): 351–8. doi:10.1001/jama.294.3.351. PMID 16030280. ^ "Vitamin E — Health Professional Fact Sheet". dietary-supplements.info.nih.gov. Retrieved 5 February 2015. ^ Bjelakovic, G; Nikolova, D; Gluud, LL; Simonetti, RG; Gluud, C (14 March 2012). "Antioxidant supplements for prevention of mortality in healthy participants and patients with various diseases". The Cochrane Database of Systematic Reviews. 3 (3): CD007176. doi:10.1002/14651858.CD007176.pub2. PMID 22419320. ^ Guallar E, Stranges S, Mulrow C, Appel LJ, Miller ER (December 2013). "Enough is enough: Stop wasting money on vitamin and mineral supplements". Ann. Intern. Med. (Editorial). 159 (12): 850–851. CiteSeerX 10.1.1.668.4335. doi:10.7326/0003-4819-159-12-201312170-00011. PMID 24490268. ^ Rautiainen, S; Manson, JE; Lichtenstein, AH; Sesso, HD (July 2016). "Dietary supplements and disease prevention – a global overview". Nature Reviews. Endocrinology. 12 (7): 407–420. doi:10.1038/nrendo.2016.54. PMID 27150288. ^ Katz DL, Meller S (2014). "Can we say what diet is best for health?". Annu Rev Public Health. 35: 83–103. doi:10.1146/annurev-publhealth-032013-182351. PMID 24641555. ^ Current Good Manufacturing Practices (CGMPs) for Dietary Supplements U.S. Food and Drug Administration (2007). ^ "Directive 2002/46/EC of the European Parliament and of the Council of 10 June 2002 on the approximation of the laws of the Member States relating to food supplements". Eur-lex.europa.eu. Retrieved 2012-12-05. ^ "European Commission website: Food Safety – Labelling & Nutrition – Health & Nutrition Claims". Ec.europa.eu. Retrieved 2012-12-05. ^ Knight, Sam (2005-07-12). "Controversial EU vitamins ban to go ahead". The Times Online. Retrieved 2012-12-05. ^ "Food supplements - Food Safety - European Commission". Food Safety. 2016-10-17. ^ "Court victory for vitamin firms". BBC News. 2004-01-30. Retrieved 2012-12-05. ^ "'EU health foods crackdown 'wrong". BBC News. 2005-04-05. Retrieved 2012-12-05. ^ "Vitamin controls backed by Europe". BBC News. 2005-07-12. Retrieved 2012-12-05. ^ "EU court backs health supplements ban". Guardian. 2005-07-12. Retrieved 2012-12-05. ^ a b c d e Dwyer, J. T; Coates, P. M; Smith, M. J (2018). "Dietary Supplements: Regulatory Challenges and Research Resources". Nutrients. 10 (1): 41. doi:10.3390/nu10010041. PMC 5793269. PMID 29300341. ^ "About Natural Health Products". Natural and Non-prescription Health Products Directorate, Government of Canada. 14 March 2013. Retrieved 3 February 2018. ^ "Complementary medicines". Therapeutic Goods Administration, Australian Government. 2018. Retrieved 3 February 2018. ^ "Dietary Supplement Ingredient Database". Office of Dietary Supplements, US National Institutes of Health and US Department of Agriculture, National Nutrient Database. 14 August 2017. Retrieved 3 February 2018. ^ "Dietary Supplement Fact Sheets". Office of Dietary Supplements, US National Institutes of Health. 2018. Retrieved 3 February 2018. ^ "Licensed Natural Health Products Database". Natural and Non-prescription Health Products Directorate, Government of Canada. 4 May 2015. Retrieved 3 February 2018. ^ a b European Food Safety Authority (2012). "Compendium of botanicals reported to contain naturally occuring [sic] substances of possible concern for human health when used in food and food supplements". EFSA Journal. 10 (5): 2663. doi:10.2903/j.efsa.2012.2663. ^ "Measurements and Standards for Botanical Dietary Supplements". US National Institute of Standards and Technology. 21 September 2016. Retrieved 3 February 2018. ^ Iannotti, L. L; Trehan, I; Manary, M. J (2013). "Review of the safety and efficacy of vitamin a supplementation in the treatment of children with severe acute malnutrition". Nutrition Journal. 12: 125. doi:10.1186/1475-2891-12-125. PMC 3850897. PMID 24028603. ^ Chen, P; Li, C; Li, X; Li, J; Chu, R; Wang, H (2014). "Higher dietary folate intake reduces the breast cancer risk: A systematic review and meta-analysis". British Journal of Cancer. 110 (9): 2327–2338. doi:10.1038/bjc.2014.155. PMC 4007237. PMID 24667649. ^ Kantor, E. D; Rehm, C. D; Du, M; White, E; Giovannucci, E. L (2016). "Trends in Dietary Supplement Use among US Adults from 1999–2012". JAMA. 316 (14): 1464–1474. doi:10.1001/jama.2016.14403. PMC 5540241. PMID 27727382. ^ Obeid, R; Koletzko, B; Pietrzik, K (2014). "Critical evaluation of lowering the recommended dietary intake of folate". Clinical Nutrition. 33 (2): 252–259. doi:10.1016/j.clnu.2013.12.013. PMID 24503418. ^ Wilson, RD; Committee, Genetics; Wilson, RD; Audibert, F; Brock, JA; Carroll, J; Cartier, L; Gagnon, A; Johnson, J. A; Langlois, S; Murphy-Kaulbeck, L; Okun, N; Pastuck, M (2015). "Pre-conception Folic Acid and Multivitamin Supplementation for the Primary and Secondary Prevention of Neural Tube Defects and Other Folic Acid-Sensitive Congenital Anomalies" (PDF). Journal of Obstetrics and Gynaecology Canada. 37 (6): 534–552. doi:10.1016/S1701-2163(15)30230-9. PMID 26334606. ^ O'Brien, K. O; Ru, Y (2017). "Iron status of North American pregnant women: An update on longitudinal data and gaps in knowledge from the United States and Canada". The American Journal of Clinical Nutrition. 106 (Suppl 6): 1647S–1654S. doi:10.3945/ajcn.117.155986. PMC 5701721. PMID 29070557. ^ Li, Y; Huang, T; Zheng, Y; Muka, T; Troup, J; Hu, F. B (2016). "Folic Acid Supplementation and the Risk of Cardiovascular Diseases: A Meta‐Analysis of Randomized Controlled Trials". Journal of the American Heart Association. 5 (8): e003768. doi:10.1161/JAHA.116.003768. PMC 5015297. PMID 27528407. ^ a b c Schwingshackl, L; Boeing, H; Stelmach-Mardas, M; Gottschald, M; Dietrich, S; Hoffmann, G; Chaimani, A (2017). "Dietary Supplements and Risk of Cause-Specific Death, Cardiovascular Disease, and Cancer: A Systematic Review and Meta-Analysis of Primary Prevention Trials". Advances in Nutrition: An International Review Journal. 8 (1): 27–39. doi:10.3945/an.116.013516. PMC 5227980. PMID 28096125. ^ Navarro, V; Khan, I; Björnsson, E; Seeff, L. B; Serrano, J; Hoofnagle, J. H (2016). "Liver Injury from Herbal and Dietary Supplements". Hepatology. 65 (1): 363–373. doi:10.1002/hep.28813. PMC 5502701. PMID 27677775. ^ Visser, M. E; Durao, S; Sinclair, D; Irlam, J. H; Siegfried, N (2017). "Micronutrient supplementation in adults with HIV infection". Cochrane Database of Systematic Reviews. 5 (5): CD003650. doi:10.1002/14651858.CD003650.pub4. PMC 5458097. PMID 28518221. ^ Grobler, L; Nagpal, S; Sudarsanam, T. D; Sinclair, D (2016). 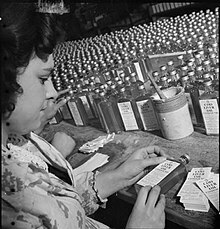 "Nutritional supplements for people being treated for active tuberculosis". Cochrane Database of Systematic Reviews (6): 1–195. doi:10.1002/14651858.CD006086.pub4. PMC 4981643. PMID 27355911. ^ a b Dunn AG, Coiera E (2014). "Should comparative effectiveness research ignore industry-funded data?". J Comp Eff Res. 3 (4): 317–320. doi:10.2217/cer.14.31. PMID 25275226. ^ Knottnerus JA, Tugwell P (2013). "The potential impact of unpublished results". J Clin Epidemiol. 66 (10): 1061–1063. doi:10.1016/j.jclinepi.2013.08.001. PMID 23993310. ^ Zarin DA, Tse T, Sheehan J (2015). "The proposed rule for U.S. clinical trial registration and results submission". N. Engl. J. Med. 372 (2): 174–180. doi:10.1056/NEJMsr1414226. PMC 4344313. PMID 25539444. ^ "ODS Strategic Plan 2017-2021". Office of Dietary Supplements, US National Institutes of Health. December 2017. Retrieved 3 February 2018. 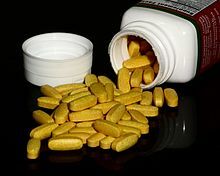 Dietary Supplement Fact Sheets, NIH Office of Dietary Supplements. Wikimedia Commons has media related to Dietary supplements.